I'm trying to wrap up a story but I keep hearing cricket-related exclamations coming from the kitchen. Eventually I get up to investigate. I say, "So uh the crickets got here toda–"
You had me at "So, a shipment of crickets for the lizard arrived via FedEx today." 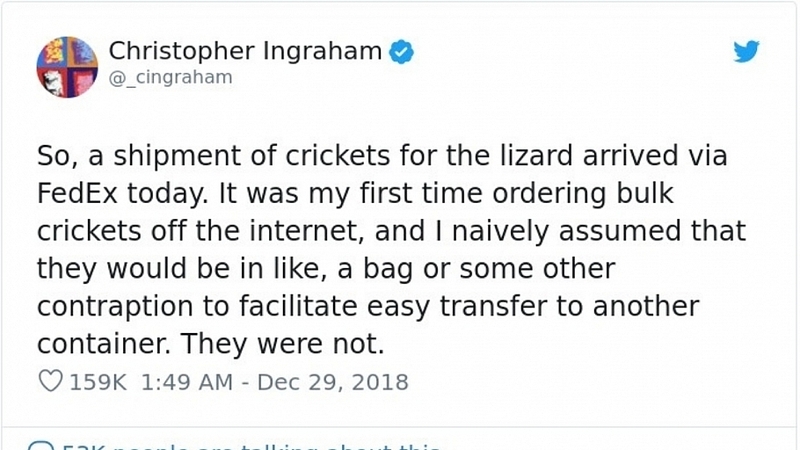 Look on the bright side, how many men can say they LITERALLY heard crickets when their wives gave them the silent treatment?! Amazon out here delivering plagues to people's homes. When I was a teenager I made this mistake with a 1000 live crickets for my pet bearded dragons. I got scared when they started jumping out and dropped the box. They were all over. I remember finding stragglers for a good week or two. My mom was so mad.